Today marks the one-year anniversary of Occupy Wall Street, a movement born of disaffection, a surface-level distrust of the political and financial establishment, and more than all that together, ennui. To mark the occasion, what is left of the group is once again taking to New York City’s streets. So far, reports that a group of three in wheelchairs attempted to block Broadway, for which they appear to have been arrested. In contrast with the Tea Party movement, Occupy Wall Street has embraced secrecy and violence, rather than transparency and peaceful protest. From the adoption of the “no-snitching” Chicago Principles to the coverup of rapes and terrorism, OWS has been an anti-American movement to its core. I could go on. Perhaps that’s the reason for the massive police presence at today’s Occupy Wall Street demonstration. Rather than just revealing the Occupy movement’s decayed values, we should pay attention to the mainstream media’s treatment of the movement and its complicity in putting forth a distorted image that glosses over the violence and presence of far-left revolutionaries. They protected and cultivated the distrust of Wall Street as some sort of cohesive and comprehensive financial policy point-of-view. I know because I was there, at Zuccotti and in Chicago and across the country visiting different Occupy protests. I saw the media hang back on the sidelines and get the story from the “official spokesperson” rather than investigating further for themselves. If anything, the lesson, one year later, from Occupy Wall Street, is that we cannot continue to allow the media to provide our information. We have to seek out alternate sources, become the media ourselves, and hold them accountable the way we would our elected officials. When Breitbart said “F*** You. War” it was directed at the left, and the media who willingly called Tea Partiers the worst of names as they demonstrated for the Constitution and for freedom. Whot?! You mean Princess Lying Cow Dances With Farts? 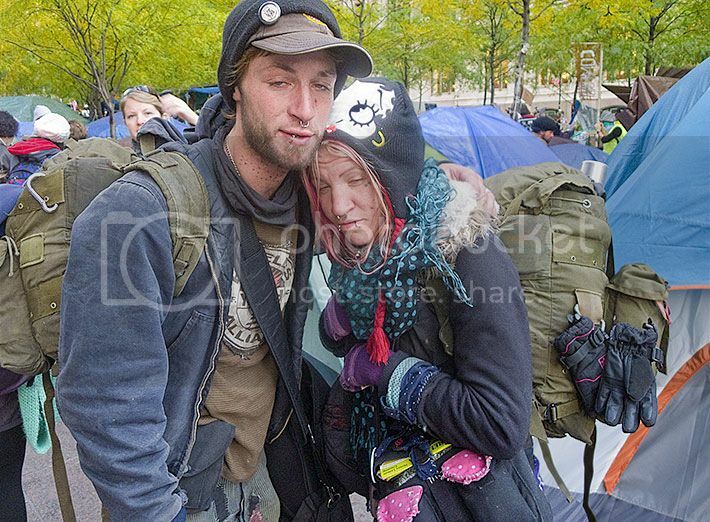 My favorite examples of Occupy dweebs. What scares me is who bred and raised these things? This is an excellent article: It is a great summary of the violent aspect of this liberal gambit, together with a focus on the corrupt media, which is one of the most dangerous enemies of our freedoms. The Right’s mistake when dealing with the #OWS movement is to think that anybody needs to defend Wall Street. There are probably more Democrats on Wall Street than there are Republicans, and their sins have been plenty. Worse, Democrats in this Administration have been complicit with Wall Street. The biggest mistake is that Democrats have forged this bond between the “sins of Wall Street” and raising taxes on the “rich.” It’s an easy jump for Democrats to make, but Republicans shouldn’t get sucked in their jet wash. I will virtually guarantee that many in the media at all levels have donated to OWS. Right on. Moreover, the Left has played itself out in its infantile and destructive glory all across the political map. We’ve got them cornered on almost every issue. Their conceits and incoherences have produced havoc in our economy, our society and across the world. From OWS to the Middle East — what are the fruits of their passions and preconceptions and policies and shouldn’t they be held accountable for them? For example, they’re now on record as asserting that Islamic violence arises from Western artistic incitement. Make them eat it. Force them to introduce blasphemy laws. Force them to ban the upcoming movie on bin laden. If this is their contention, make them stand by it. Likewise, why isn’t every republican reciting the crime statistics and sordid history of OWS and demanding democrats defend it or disavow it? Are we running a campaign here or what? The Occupy movement backfired because it revealed to the ‘common voter’ (the real 99%) the class and calibre of the 99% of Obama’s supporters (or the 1% who are radical socialist/marxists). It’s refreshing to see that tone here. This is war — if we fail to push-back, we’ll be pushed off a cliff. This is as refreshing as Rush Limbaugh’s spoof of an Obama press conference. He finally used the “c” word to describe the news media: corrupt. This is starting off to be quite a refreshing day. At the very least, Occupy has shown us there were a lot more babies dropped on their heads than we thought. I saw the media hang back on the sidelines and get the story from the “official spokesperson” rather than investigating further for themselves. Another story they didn’t get: whence came the funding to set up all those cancerous camps and keep that cancerous movement running for months? We know that the Zucotti mob raked in about $700,000 from international donors in the heat of the moment (and that their ‘financial committee’ made sure that the spending of that loot wasn’t democratically controlled). But who paid to set up and sustain all the other camps in the country? It wasn’t the deadbeats who lived there, nor the recreational rioters who loved the media attention. Partly, it was the taxpayers of the municipalities who refused to enforce their own anti-vagrancy laws. But there was national coordination, an active PR campaign and a complicit media, on top of all the logistical expenses of each squalid tent city. So where did that ‘funding’ originate, and how was it delivered? The leftists/progressives/Marxists are composed of extremely violent groups. If their messiah Obuma is defeated this Nov., expect fire in the streets. The surprise will be when they are fired back upon — which is probably what their handlers want. Imagine the Democrat media playing up that one? The handlers of these people (ultimately Barack Obama, because the schumck — I mean, buck — stops with him) are truly trying to ferment a revolution in this country. Remember who has the guns. It ain’t them. “Brent Betterly, 24, Brian Jacob Church, 20, and Jared Chase, 24, were charged Saturday with a terrorist conspiracy to firebomb four Chicago police stations, the home of Chicago Mayor Rahm Emanuel and President Barack Obama’s local campaign headquarters. Stephanie Auguiste, a 25-year-old from Hollywood, Fla., met all three of the alleged bombers through Occupy Fort Lauderdale, a Florida offshoot of the Occupy Wall Street movement. #Occupy Wall Street: 25 Arrests Made as Movement Celebrates 1-Year Anniversary#…more proof that the OBOZO re-election campaign and its union backers still have lots of money to throw around supporting other despicable, anti-American, criminal extremists as their astro-turf. Remember, elizabeth “fauxcahontas” warren is the self-proclaimed “mother” of the #occupy vermin. Sorry, but the quote “… OWS has been an anti-American movement to its core….” set me off. …sit down on their collective asses to whine and complain about the situation. OWS suddenly pretends we all live in a vacuum, are complete idiots, and need to be told how bad Obama screwed things up. They conveniently omit the part about Obama making things worse. Their ‘solution’ besides some nebulous complaints, shirking all responsibility for their own screw ups, is to place blame on the rich, as if class warfare somehow fixes anything. The myth of the class struggle is a well worn and classic Socialist/Communist tactic. We can guess which current leader of the free world approves of all of this. How more anti-American could this get? Maybe they could pass out some berets, red wine, and rifles for them to drop? They are already self-unemployed, so put on togas and get drunk on retsina? No, it would be more appropriate to wear ushankas (Russian fur hats) and drink vodka. Classic Marxist/Leninist rhetoric and it is definitely anti-American. It’s gonna get a low worse before it gets better.